The Magellan™ 3400VSi series of scanners continue the Datalogic tradition of high performance imaging for the highvolume point-of-sale. By duplicating the speed and large field-of-view of laser scanners and expanding the capabilities of imaging, the 3400VSi scanners provide outstanding performance on hard-toread bar codes and seamless reading of a wide variety of bar codes. 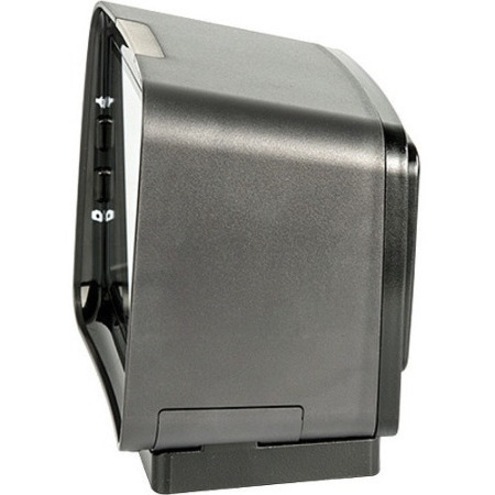 This Magellan scanner enables both high speed sweep and presentation scanning techniques, ensuring maximum productivity and ergonomic ease, even with truncated (shortened), out-of-spec or poorly printed codes. The optional Magellan Customer Service Scanner (CSS) enables retailers to easily engage their customers in mobile commerce programs, allowing them to scan bar codes from mobile phone screens or paper coupons while the cashier continues to scan regular items in parallel, resulting in a significant reduction in total transaction time. Remote Management is supported for OPOS, JavaPOS, Toshiba Remote Management with IBM Systems Director® and Wavelink® Avalanche®. Additional capabilities are available with the Value Added Features included in every Magellan scanner. Autodiscriminates all standard 1D codes including GS1 DataBar™ linear codes.